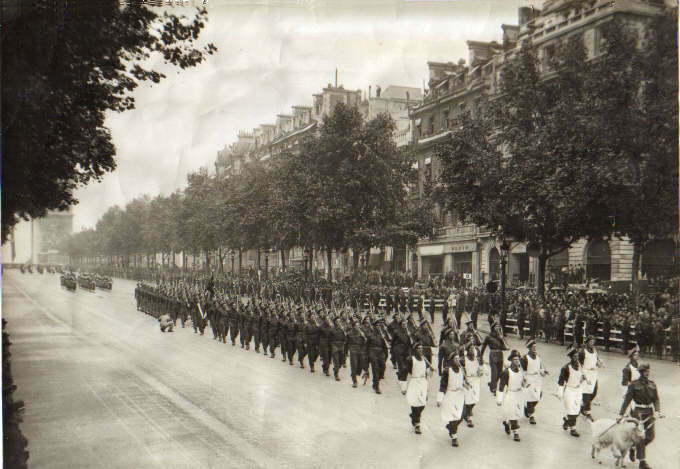 "At very short notice the Battalion was ordered to send a contingent to Paris for the Victory Parade on Sunday 12 May to represent the British Army, to mark the first anniversary of the end of the war. "The contingent, which was commanded by Major Cooke, included colour party for both Colours and the Pioneers and Goat. "The first order to go was received by the Commanding Officer at about half past eight in the evening of Friday May 10th; the whole battalion was out for the night on an exercise, nearly 30 miles away from Caernarvon Barracks [Düsseldorf] and was having a few hours recreation before the scheme started. At that moment the C.O. was in a boat on the lake. The adjutant had to climb down through the pine trees on the hillside to tell him what had happened. He immediately gave the order to strike the camp, and all men, who had been expecting a pleasant evening sing-song had to turn to and take down their bivouacs. "The transport had to drive home in the dark, and did not reach Caernarvon Barracks till 1.30 in the morning. "All men, who were going, then had to be selected and warned; in some cases they had to be wakened up, including the goat, who did not approve of night moves. They started to get out their best suits of battledress and clean up during the early hours; had some breakfast about half-past four and were ready to move off in the transport by five o’clock."